Larry Miller of Swampscott, Mass. 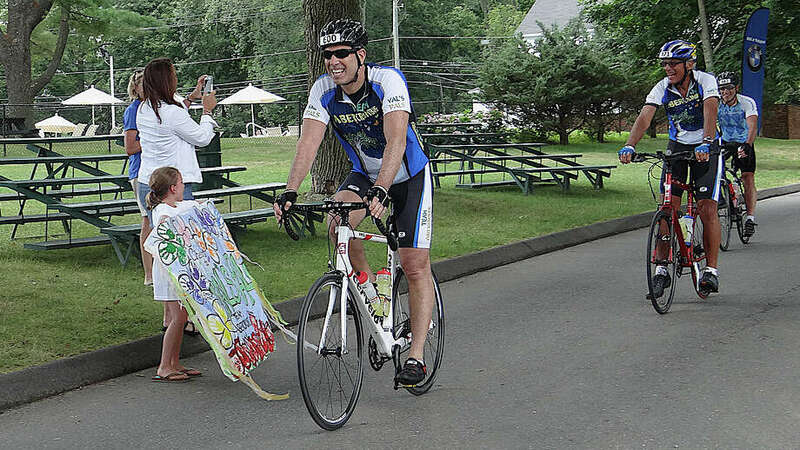 ; Ron Kramer of Boston, and Mike Brody of Amherst, N.H., cross the finish line of the CT Challenge Bike Ride 80-mile event Friday at the Fairfield County Hunt Club. Entering a new cycle in its ninth year, the CT Challenge bike ride kicked off upstate for the first time, but the goal was the same: raising money to support survivors of cancer. By 2 p.m. Friday, more than 30 riders out of a pack of 80 who set out earlier on the 80-mile ride from the Interlaken Inn in Lakeville had arrived at the Fairfield County Hunt Club, where on Saturday hundreds more were to bike various routes and, again, raise money for the charity. "Some of our strongest riders rode the 80-miler today (Friday); many will also be riding the 100-mile tomorrow," said Julie Pemberton, director of communications for the event. "Besides the 100-mile, tomorrow's lengths include a 10-, 25- and 75-mile ride." Pemberton said as of Friday more than 1,000 bike riders had registered and that more were expected to sign up Saturday. "We would love to be at 1,200," she said. "This is shaping up to be our best ride yet." Pemberton credited the 80-mile event with helping attract more participants this year, as well as the cooling break in the heat wave over the preceding week. Friday "couldn't have been better cycling weather," she said. "Nice and cool, in the high-70s, mostly dry. Everyone has been coming in strong." Adam Pemberton of Redding, Julie's husband, was first to cross the finish line in the 80-mile ride, recording a time of about 4 hours, 30 minutes. The event is not officially timed, so Adam estimated his time. Founded in 2005 by Jeff Keith, a pediatric cancer survivor and amputee who gained note by running cross-country, and Jeff Ragland, a cycling enthusiast and business entrepreneur from Westport, the CT Challenge helps cancer survivors and raises funds to support cancer awareness. In 2012, the organization built the Center for Survivorship in Southport, the first stand-alone survivorship program of its kind in the nation. "Now in its ninth year, the event has raised well over $9 million, not including this year, to fund programming for cancer survivors," said Julie Pemberton. "Funds support the CT Challenge Survivorship Network that has 19 of Connecticut's community hospitals and cancer centers as members." Pemberton said all the riders in the two-day event have been personally affected by cancer "whether a friend, family member, co-worker or themselves ... We have over 85 cancer survivors as riders as of yesterday and expect more. Another 50 also signed up as volunteers." Student participants are required to raise a minimum of $250; adults $500 for the 10- and 20-mile events, and up to $2,250 for the 2-day period. Besides supporting a the cause of cancer survivors, riders feel a sense of great accomplishment. "It's challenging," said Lisa Karp of New Canaan. "I'm a runner and this is my first time doing this. My husband is a cyclist and encouraged me. It was fun -- now that it's over. It started sprinkling a little, it felt good."